One more member of the Star Trek family has left us. 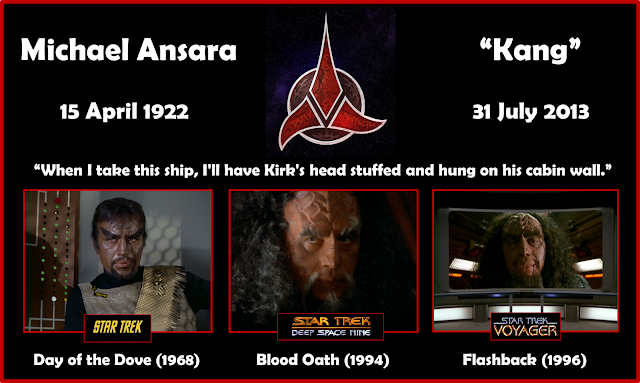 Here's our (small) tribute to the third of the original series Klingons, Michael Ansara. Sadly Ansara's death also means that we have lost all three of the actors who brought the characters of Kor, Koloth and Kang to life in the 1960's and again in the 1990's on Deep Space Nine. Ansara also had a further role in Star Trek as Lwaxana Troi's husband, Jeyal, in the fourth season episode The Muse. In the big picture though it is his role as the Klingon Kang on three occasions that he will be most remembered. While he might have died with honour in Blood Oath we would get to see Ansara reprise his signature Star Trek role opposite George Takei in the 30th Anniversary Voyager episode, Flashback. Our thoughts go to his family. He will have been welcomed warmly through the gates of Sto'Vo'Kor.